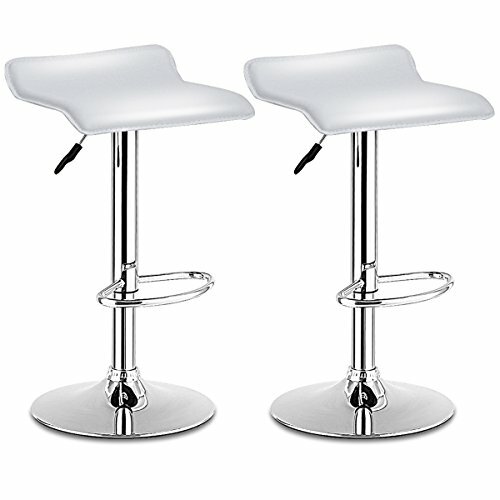 The swivel backless bar stools set combine a simple and classic design with great comfort and durability. And it is perfect for your family or friends gathering, party and other gathering activities. Made of PU leather seat and humanization design make it not only modern but also long lasting and make you feel extreme comfortable and relaxed when you sit on it. Don't hesitate, just buy one set! 【Modern & Classic】These upgraded bar stools combine the modern and classic style, which are perfect for your restaurant, bistro, coffee house, patio, home kitchen or any other decor theme. 【Comfortable Design】The built-in footrest is durable and stable which provides a comfortable place to rest your feet. 【Height Adjustable】The side pneumatic handle adjusts the height from 26.4" to 30.3" easily and safely. 【Non-Marking】The stool stands on a sturdy circular chrome steel base, which has a 14.1" rubber ring to prevent your floor from scratching. 【Easy Handling】This high quality stool is made of PU leather and chrome steel, which is wear-resisting, ageing resisting and has no peculiar smell.